Just because you’re on a budget, that doesn’t mean that you don’t deserve to have good audio quality while you drive. In fact, we would go as far to say that you don’t even need to blow your budget to get a high-quality speaker system for your car. Whether it’s a component system or coaxial, there are plenty of options out there for a perfectly reasonable price (let’s say under $100, but we’ll try to stay closer to $50). One of the problems with car speaker systems is that often there are TOO many options to choose from in order to find the best cheap car speakers. Do not fear! We have done all the digging for you. We’ve scoured and scoured and have compiled a list of the 20 (yes, 20) best cheap car speakers. Maybe you have an old car and anything would be better than the current speakers. 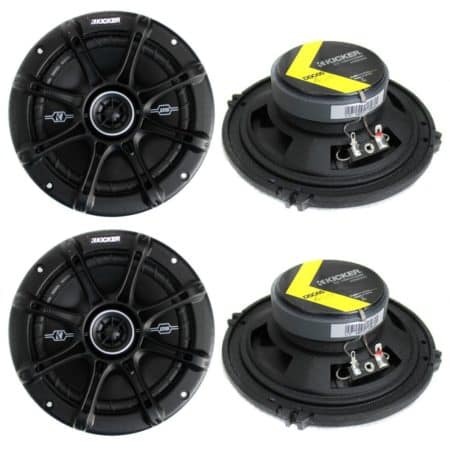 Or maybe you’re just looking to upgrade the stock speakers that came with your new car. Whatever the reason, we have tons of cheap speakers for you to choose from. Hopefully, by the end of this list, you’ll have found the perfect pair of car speakers that didn’t cost you an arm and a leg. Starting off our list we have a set of speakers from BOSS. 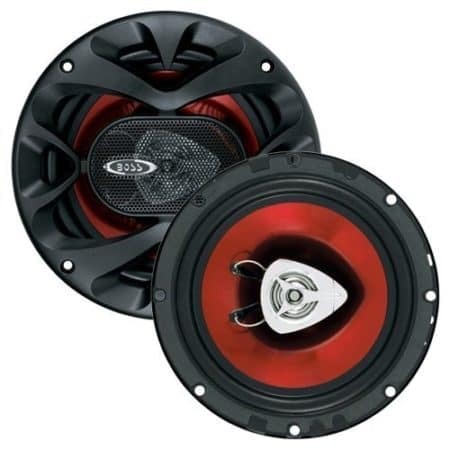 If you’ve ever shopped around at all for any sort of car speakers, you have definitely come across some from BOSS. They’re actually well known for producing quality speakers at a much lower cost than a lot of their competitors. These are full-range speakers and you can order them in a variety of sizes to fit whatever car you have. There’s even a tool on Amazon where you can input your exact car make and model to determine which ones are going to fit. These are under $20 and they actually sound pretty decent. We don’t recommend cranking them all the way up, but you can put them pretty loud. They operate at 250 watts max, have a 100 Hz to 18 kHz frequency response and 90dB sensitivity. They even come with a 3-year platinum dealer warranty. For the price, you have absolutely nothing to lose. 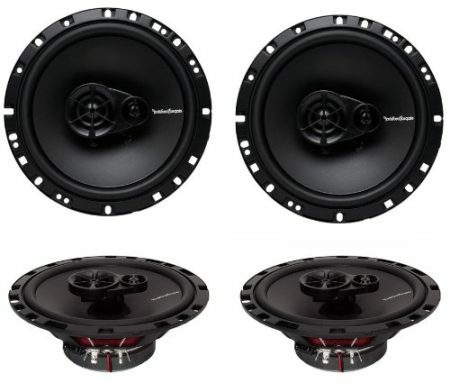 Rockford is up next with a pair of full-range, 3-way coaxial speakers. These pack quite the punch for their price and you could easily have mistaken these for $100 speakers. They feature a vacuum polypropylene cone with a rubber surround that really works to propel the sound throughout your car. The mounting depth is 2.15 inches, just as an FYI. Rockford also includes in these speakers an integrated tweeter crossover. Of course, this isn’t as ideal as having them separate but for the price we have to admit, it works pretty well. Both the grilles and mounting hardware is actually included in the price so you’ll be good to go straight out of the box. They’re fairly easy to install if you have the experience but if not, then it shouldn’t take a professional too long to get these up and going. All in all, a solid set of speakers for the price that will definitely be an improvement over most stock speakers. 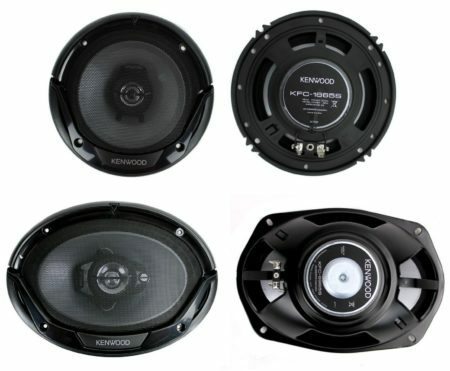 Kenwood is up next with a set of 400-watt 3-way car speakers. This set is a little pricier than the previous two but you really get quite the deal for the money. For under $60 you’re actually getting four speakers. You get two 6.5” speakers and then two 6×9 speakers so you’re actually able to fully outfit your car. These are coaxial speakers that sound like they could be component speakers. They also feature a 2” PEI balanced dome tweeter as well a 1” super tweeter to really help you ensure that those highs and mids are crystal clear and smooth. The speakers are cased inside of a black steel basket that helps greatly to reduce noise cancellation and help you achieve the superior sound you’re looking for. You don’t have to turn these up all that much really, although they’ll be able to handle it without much distortion. Kenwood gives us a great set of cheap speakers that will be a welcome addition in anyone’s car. JVC is a versatile manufacturer that makes a wide array of audio components. They’ve been around for quite a while at this point and we really trust them. They also happened to give us a banging pair of cheap coaxial car speakers. These are 6.5” and are surrounded with a mica cone. It’s a hybrid of rubber and cloth surround that helps to amplify and prevent any distortion of sound. There’s also a 1” Poly-Ether Imide balanced dome tweeter to give help complement your sound. 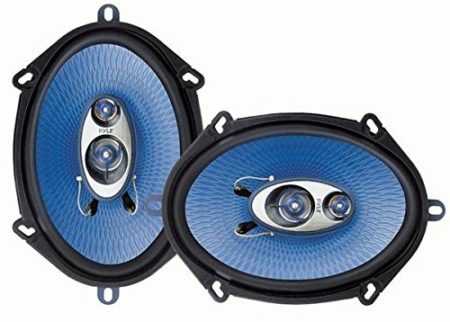 Another pair of decent cheap car speakers – these are only around $20 bucks. How can you go wrong? You’re getting a pair of name brand speakers that will serve their purpose. They’re cheap, easy to install and don’t sound half bad. We definitely recommend these and honestly don’t have much to complain about with them. We think they’ll sound great in just about any car they go in. The first set of Pioneer speakers on our list (because there will be more than one) are the TS-A1676R series. They sound amazing and if nobody told you, you wouldn’t be able to guess that they’re under $50 (at the time of this article). They give you 320 watts of max power. There’s also a multilayer mica matrix cone design for optimum sound reproduction. The audio sounds extremely realistic and exactly as it was intended to sound when it was recorded. 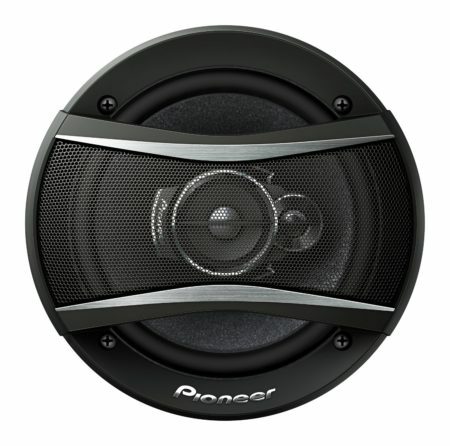 Pioneer also gives you a lot of options to buy a speaker that’s going to fit your exact car. 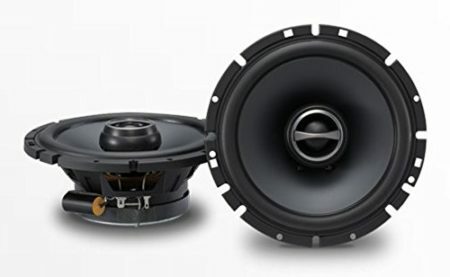 This is one of the speaker sets that allows you to actually input your exact car make and model so you make sure that you choose the specifications that will actually fit your car. Overall, these aren’t the cheapest speakers on our list but they are some of the loudest and best sounding. We highly recommend them and think that they’re going to be tough to beat. Pyle is quite possibly the king of cheap car speakers. They have tons of different variations of speakers that are extremely reasonably priced and really don’t sound that bad. This is another perfect example of that. The PL63BL will only cost you around $20 but the sound quality is definitely there. It has a frequency response of 90 Hz – 20 kHz and has 360 watts of power handling. They also include the grilles, cable, and mounting hardware so if you know how to install these – you’ll be good to go straight out of the box. The woofer features blue poly injection cone with butyl rubber surround which helps to evenly project the sound throughout your car. Also, the surround will easily withstand all harsh vehicle environments. A lot of sunlight? A lot of cold weather? Left your windows down during the rain? These can withstand it all – to a certain degree, of course. Not to mention, the blue looks great in just about any car. It’s not over-bearing but gives a nice subtle color. 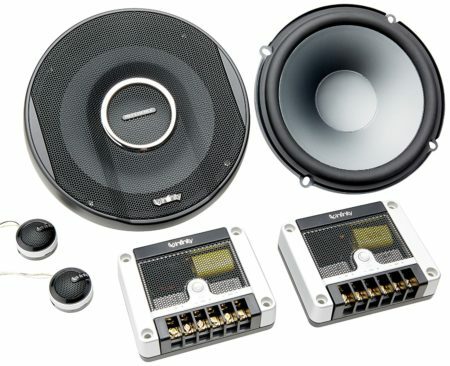 Kicker is another reliable brand when it comes to car speakers, especially cheap car speakers. This is definitely one of the priciest sets on our list at just under $100. But with the extra money, you do get extra value. There are four coaxial speakers and they all work really well together to create a clear, rich sound that will fill your entire car. They have an extremely thin profile and there’s zero to minimal tweeter protrusion. You’ll get a max power of 480 watts, and that’s for all four speakers combined. If this is more than you’re looking to spend, then we get it. There are plenty of other options on this list. However, if you’re able to stretch the budget a little bit and in return, get a little bit of extra quality – then we recommend going with Kicker 41DSC654 D-Series. You’ll love the experience you get and absolutely will not be disappointed. 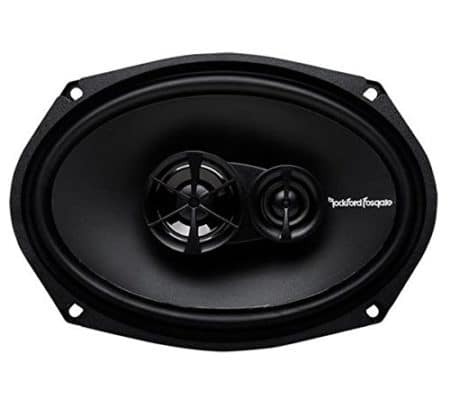 Rockford Fosgate is a lesser known brand when it comes to car speakers but a brand that delivers nonetheless. They are in a flex fit basket design and are surrounded by butyl rubber. The butyl rubber is great a reproducing the sound and also very weather resistant. They have a frequency response of 65 Hz – 24 kHz. These have a max power handling of 130 watts and a sensitivity of 90 dB. Where these speakers truly shine is with the bass. However, with that being said, don’t underestimate how crystal clear the highs and mids sound. These are great all around speakers that deliver a lot of quality for their price. They’re also particularly easy to install. If you know what you’re doing, or go to somebody who does – these will be up and running in less than 20 minutes. All in all, definitely a top contender for the best cheap car speakers. 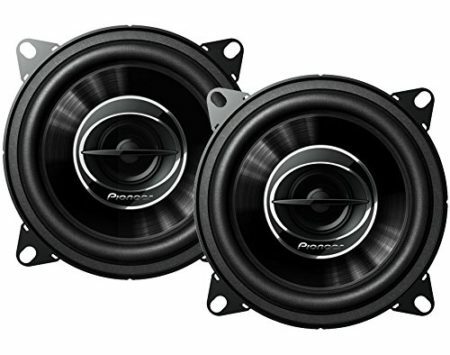 We love the Rockford Fosgate Punch P1683 and know that you will too. Pioneer sneaks its way onto our list with another pair of reasonably priced, high-quality car speakers that will leave you wondering if these actually cost you $200. They give you 420 watts of max power (combined) and are in Injected Molded Polypropylene with a MICA cone woofer. They sound super high-quality and you won’t believe that you spent less than $30 on them. The cone delivers higher power handling and deeper bass than you could ever possibly hope to get with speakers in this price range. These might be the best car speakers for bass without a subwoofer. These have an extremely shallow mounting depth so they can easily go into any car. One thing to note is that the speaker grilles are actually not included but at this price, you can afford to pick some up – they really don’t cost that much. The bass is pretty deep, but they definitely excel in delivering highs and mids. If you’re a bit of a bass head, we definitely recommend picking up a subwoofer. If you don’t mind a well-rounded sound with a normal amount of bass, then you should be fine with these. Pioneer definitely delivers with the TS-G1045R speakers. Up next is another set of car speakers from Rockford Fosgate. They are quickly becoming one of our favorite brands and definitely deliver with the R169X3s. These speakers are in a vacuum polypropylene cone with a rubber surround to really amplify the sound. They even feature an integrated tweeter crossover. As an added bonus, grilles and mounting hardware are even included! These are full-range speakers that really deliver on sound and for a reasonable price, we’re actually very impressed with the sound that they produce. They’re super easy to install and you can easily do it yourself if you have no idea what you’re doing. 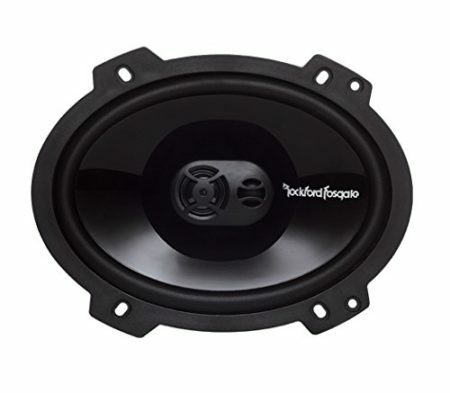 The Rockford Fosgate R169X3 will easily be an upgrade to most stock speakers that you have. And like some other speakers on the list, Amazon includes a tool for you to check if the specific make and model of your car are compatible with these. Overall theses are a solid option for the price. Another decent set of speakers from Pyle is up next on our list. These feature a no fatiguing butyl rubber surround that does an amazing job at withstanding the varying amount of weather that your car will inevitably go through. Think about it, your car is constantly left sitting in the sun and also subject to cold winter nights sitting in the driveway. Your speakers are going to need to be able to withstand extreme temperatures on both ends and these do just that. Aside from sounding great, they also look great. They deliver a really well-rounded sound. The mids and highs are crystal clear and you can actually get a decent amount of bass from these as well. We don’t recommend trying to crank them and blow the bass, but you’ll get a well-rounded sound that will sound good for a majority of songs. They allow for 80 Hz – 20 kHz frequency response so you’ll be getting most of what you need. 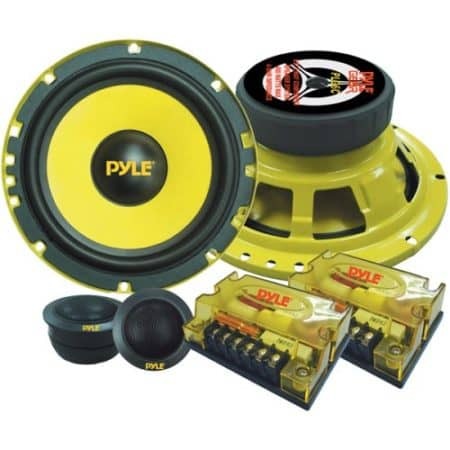 We know we know, we just included a Pyle speaker system! But they really do an amazing job at delivering quality speakers at prices that are perfectly reasonable. And of course, they manage to do the same with the Pyle PLG6C. Best of all – this is an entire component system for under $30! Most on our list have been coaxial, mostly because component systems tend to cost more. But of course, our favorite company Pyle has managed to make a reasonably priced, nice-sounding component system. These could be the best budget 6.5 car speakers. You, of course, get two woofers, two tweeters, and two crossover systems with these. The woofers are in a special electroplated steel basket that helps to preserve the quality of the sound and really allow the sound to travel through your car. Component systems tend to be a bit more difficult to install as well, but Pyle has included a full wiring kit as well as a wiring diagram. We definitely recommend only trying this if you’ve installed speakers in your car before and if you have, this should be easy enough with the wiring kit and diagram. Next on our list is a brand that you potentially may have never heard of – Cerwin Vega. But as we’ve learned, don’t let the lack of brand recognition stop you from trying out a new product. Cerwin Vega delivers us a sleek 3-way coaxial speaker system that has a max power of 350 watts. Not too shabby. It also has a frequency response of 50 Hz to 18kHz so you’ll really be able to hear the bass in all your favorite songs. It also has a 94 dB sensitivity so you can actually crank this up pretty loud. These speakers are amazingly priced. We think they’re a steal. Cerwin Vega really delivers on quality and these can easily compete with any speaker system at double or triple the price. Guaranteed, they will sound much tighter and cleaner than a huge majority of stock speakers out there. If you haven’t experienced the quality that is Cerwin Vega, we recommend you give these a try. And for the price, can you really go wrong? Infinity makes its first appearance on our list. This isn’t for lack of quality that’s for sure, but it is for the price. This is one of the few component speaker systems on our list just for the fact that component speakers tend to cost much more. This comes with two woofers, two tweeters, and of course two crossover systems. They have a peak power of 540 watts and a 93 dB sensitivity. They also mount at a fairly shallow depth of 2 1/16”. The tweeter size is 1” which is pretty standard. These Infinity speakers are definitely a bit more expensive. However, they do stick to our rule of being under $100. With that money, you are getting a full component speaker system that looks great, delivers powerful bass as well as piercing highs. If you listen to a lot of jazz, orchestral music, or music with a lot of vocals – they will sound like completely different songs through these speakers. If you have the extra money, we say you go for it. There’s just no way that you’ll regret buying these. One thing to note – they are a bit difficult to install so we recommend having a professional install them, lest you mess anything up. Polk Audio is another well-known brand in the world of component speakers and boy do they deliver with the DB561 speakers. They have a max power of 360 watts and are actually marine certified! So not only will they withstand any moisture buildup that may happen in your car, these could easily be used on a boat, outside, or even on your RV. These speakers were not haphazardly designed – they were engineered specifically to give you the least amount of distortion as possible. These are coaxial speakers and while coaxial speakers usually don’t deliver a super strong bass, these are an exception. Compared to a lot of speakers in this range, they really allow you to turn up your bass and blast your favorite songs. These are a tiny bit pricier than some others on the list, but they are worth the money in our opinion. Polk Audio delivers with this DB651 model. 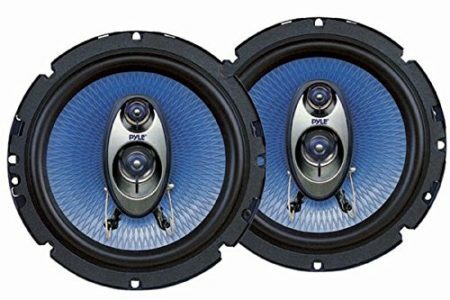 These car speakers from Alpine really give you a great balance between price and quality. They are over $50 so admittedly a bit higher than a lot of the others, but the quality that you get easily makes them worth the price. You get 240 watts of peak power and they sound great at that level. The Alpine SPS-610s really excel with highs and mids. If you’re looking for speakers to deliver powerful bass, you, unfortunately, won’t find them here. You’ll definitely need a subwoofer to complement the beautiful highs you’ll get from these. These easily match any high-end car speaker systems, including Bose. They sound amazing in any car set up whether it’s a tiny VW Beetle or a Suburban – these will complement any car very nicely. They’re also fairly easy to install so if you have little to no experience, you could probably figure out how to get these in. If not, go see someone and have peace of mind and get them installed in 15 minutes. Overall a solid pair of speakers and definitely worth the slightly higher price tag. Another set of Rockford Fosgate speakers make it onto our list and we are absolutely in love with them. The sound that you get from them is astonishingly clear and with very little distortion. This is a set of four speakers that even includes the grilles for all the speakers! 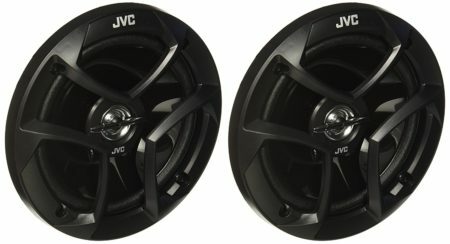 These are perfect for replacing just about any set of stock speakers that come with your car. They will definitely be a welcomed upgrade and your favorite songs will soar out of your car windows in a way that you’ve never heard before. These produce an all-around great sound. They provide a great experience for the mids and highs but don’t forget to include the bass. These are over $70 but you’ll get four speakers in the set and also a very well-rounded, superior quality to a lot of other sets on the list. These are definitely a top contender for the best cheap car speakers. 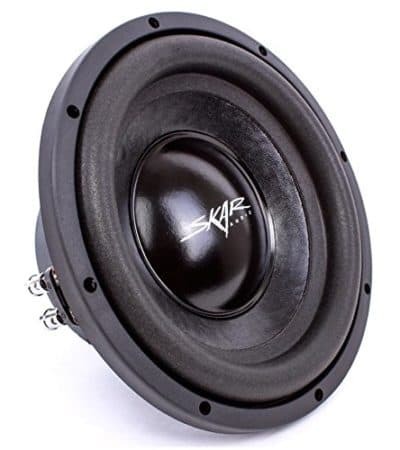 If you’ve never heard of Skar Audio, we seriously feel bad for you and think that you should start now. The sound that comes out of these is truly astonishing and at a price of under $50, they couldn’t offer you a better value if they tried. They’re in a pressed paper high strength cone that really amplifies the sound without creating too much distortion if any at all. They also feature and advanced airflow cooling system that will help to preserve the life of your speakers. This will save you money down the line because it really will extend the life of these speakers. You can easily get months of extra use out of these because of that. All in all a great affordable, reliable set of speakers that we cannot recommend enough. Even if you’ve bought a set of cheap speakers before, there’s always something else that you can learn. Every time you upgrade, you learn about something that you should’ve bought or done differently. Or if this is going to be the very first set of component speakers you’ve ever bought, then it can be a bit overwhelming and confusing. That’s what we want to help with! To help make your decision a little bit easier, we’ve decided to include a buyer’s guide so you can easily see all the important factors that go into purchasing your very first set of car speakers. 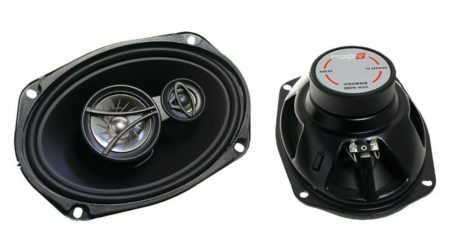 So whether this is your first or fifth set, check out our buyer’s guide below to make sure you don’t miss anything before you buy the best cheap car speakers out there today. But first, watch this video, which shows you exactly why you should buy aftermarket car speakers, if your current one is not good. The first thing you should know is exactly what type of car speaker system you’re actually purchasing. There are two main types: coaxial and component. A component system is exactly what it sounds like. It has each component separate so they generally come with a set of woofers, a set of tweeters, and a crossover system. The pros are that they usually deliver a much more well-rounded sound between highs, mids, and lows. Each is more distinct since they have a dedicated component to them. The negatives: they tend to be much more expensive and more difficult to install. Coaxials, on the other hand, attempt to combine everything into one speaker. They can do a decent job and depend on who you ask, do just as good of a job as component speakers. They tend to be much cheaper and much easier to install. This may not seem like a big deal but it actually has a big effect on what type of sound the woofer will produce. You want to make sure the material is stiff but also lightweight. Polypropylene is the default for a lot of manufacturers and this will serve the purpose most of the time. Polypropylene mixed with a material like mica is even better and will give you an even more accurate bass response. Yes, the material is going to vary between what is being used on your woofer and what is being used on your tweeter. Also, this will only apply if you are buying a component system. They each need a certain type of material to be able to perform optimally. On your tweeter, you’re going to want a softer type of material like perhaps some sort of textile blend, or silk even. It makes the sound a lot more mellow while still refined. If, however, you like the bright sort of sharp sound in your highs, then you can consider going with a harder material like you would use in your woofer. However, a softer material is generally recommended. These are used to separate the frequencies that are being sent to the woofer and the tweeter. Again, this will only matter if you happen to buy a component speaker system. Since each is meant to produce a certain frequency, this helps to ensure that both the tweeter and the woofer aren’t wasting energy trying to produce sounds that they shouldn’t be producing. As a result, you’ll get a much cleaner sound that’s efficient and much more accurate. Component speakers generally come with external crossovers, although there are a couple on our list that has crossovers that are not external. External ones work better but are generally more complicated to set up. See! We told you. There are tons of options for a cheap car speaker system out there. In fact, every single one on our list was under $100 with a majority under $70. They all come in varying sizes and have pros and cons obviously, so whichever ones you ultimately choose will depend on exactly what you need them for. 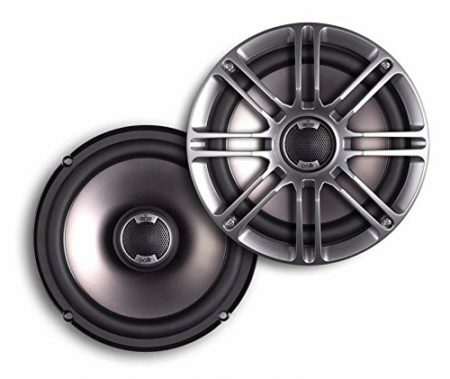 With that being said, we think there is one pair that we are ready to dub the best cheap car speakers out there. Care to guess which ones they are? Go ahead, we’ll give you a second. Alright! 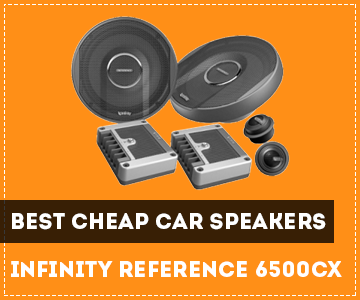 The best cheap car speakers of 2018 have to be the Infinity Reference 6500CX! They are one the upper end of our price limit but we truly believe they’re worth the extra money. You’re getting an entire component speaker system at a perfectly reasonable price from a reliable name in the audio industry. 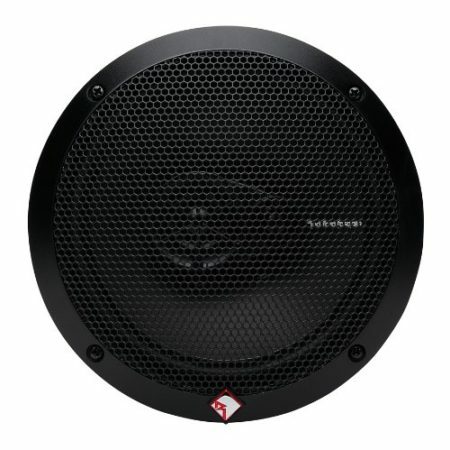 You get 540 watts of power with 93 dB sensitivity. The highs are amazingly clear, along with the mids and you even get a bit of bass which generally doesn’t happen. We can guarantee your happiness with these. As always, we want to thank you for reading! We hope you’re on your way to getting yourself a pair of quality cheap car speakers. Enjoy!